While the line from Zebra Katz above is used in an entirely different context, ima take it. In the midst of intense political upheavals, a crumbling of the U.S. government at the hands of the incompetent-in-chief, I have Katz lines in my heart and head. The last few weeks had me immersed in the voices of European writers as I tried to wrap up my #FinestFiction challenge. After the shortlist was announced, with about two books left in the pile, I decided to forego the last one and wring my hands in frustration at the current title I was holding. I just don’t get it is an honest way of saying it, but I prefer I think I’m way off my preferred genres but I will give this another try. And so I did, until I came to a point where I just didn’t care anymore. The first day of the month found me in sunny Los Angeles, and I was grateful to be holding Celeste Ng’s Little Fires Everywhere in my hands. I was somewhere in the Fairfax District, drinking an overpriced matcha latte accompanied by an equally overpriced avocado toast. I was really going for an aesthetic that matched Ng’s book cover with my food and drink, but I realized after I’ve devoured everything that I was too engrossed in the text to even remember taking an Instagram-worthy post. I was mildly comforted and repulsed at the same time with the thought. Such are the times. October is officially fall, although it feels like the onset of a real summer here in the Bay Area. I was going to say that now would be a good time to cozy up with a book, but when is it never a good time? My commitment to reading last month’s list is half-assed at best, because I only really finished four out of the eight I listed. I tried to finish three others (one was written in deep Tagalog, the other one was too weird, and the last just didn’t interest me). The eighth one I never even bothered to crack upon because I knew it wasn’t really up my alley. I want to be more intentional this time, and really trust my gut feeling when it comes to literature. Sure, there is a lot to gain by being exposed to other genres and books I wouldn’t normally pick up. At the same time, I feel like I wasted hella time giving some of these titles chances, only to give up halfway. Lesson(s) learned. Three of these books are shortlisted for the National Book Foundation awards (Smith’s for poetry, and Machado and Lee’s for fiction). Half of my reading list is supplied by the book subscription company Book of the Month which I truly adore. Sign up here! I just reviewed a book (Vivian Gornick’s The Odd Woman and the City) chosen by Rachel Khong for a quarterly magazine in Oakland. Miéville’s book is as timely as ever as the October Revolution led by Vladimir Putin happened in October 25, 1917 (or November 7, new style) and here we are in 2017, a decade later caught up in election scandals with Russia. And that there will definitely be more books added to this list since I’m already halfway through the third one. Are you reading any of these books right now? Let me know in the comments below! Note: This blog post contains spoilers — read at your own risk! It all started with Colson Whitehead’s book The Underground Railroad. After reading it and seeing Colson in person in San Francisco, I’ve wondered whether the book was going to make it into the big screen. The good news came after I found out Barry Jenkins closed a deal to adapt Whitehead’s masterpiece for television. I’ve never heard of Barry Jenkins but soon enough, I started seeing his name on headlines again and this time, for a movie that’s been hailed as “best of the year” — Moonlight. I saw the movie last night at the New Mission and I saw what everyone else has seen: a three-part coming-of-age movie with layers of brokenness and tenderness, with Chiron, a gay black man at the center. 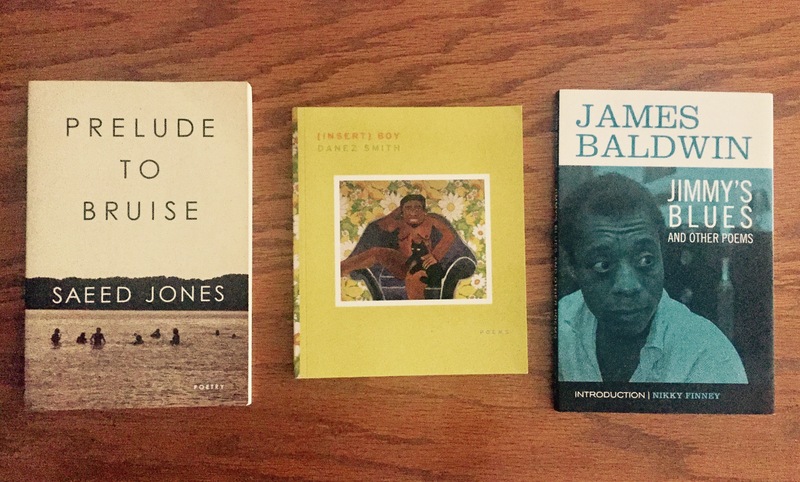 I’ve always looked up to queer black writers for their genius and while I am a queer immigrant woman of color, I realized that so many of the film’s elements have influenced a lot of my own life in three particular ways, through three brilliant poets: James Baldwin, Danez Smith and Saeed Jones. In Saeed Jones’s book Prelude to Bruise, I reread a few of my favorite poems like Blue Prelude and After Last Light. After a particularly hard day at school, after being made fun of his demeanor, his clothes, Chiron made it to the ocean where he met up with Kevin. The latter has been the former’s sole friend. By the water, Chiron was raw, honest, vulnerable. my throat is the ocean now. When he was younger and ran away from a group of boys who was bullying him, he hid in an abandoned house where he was discovered by Juan, a drug-dealer-turned-father-figure. Every time Chiron felt like he couldn’t stay at home, with a mother who was addicted to crack cocaine, he ran off to Juan’s house where he and his partner Teresa (Janelle Monaé!) took care of him. Juan took Chiron to the beach one time, where he taught him how to swim. In spite of the dynamics of their relationship — Juan, being the drug dealer, his mother, the crack cocaine addict — the scene of teaching the young one how to swim moved me beyond words. I turned to James Baldwin with a poem from Jimmy’s Blues and Other Poems. Lastly, I turned to Danez Smith’s [insert] boy as I thought of Chiron’s relationship with his mother. It was a tumultuous relationship, punctuated by periods of respite with Teresa (Juan had passed at this time). When he was much older, he was able to reconcile with this mother and it was in these moments that I felt like he was finally at peace. She knew he was “soft,” she knew he was suffering but her own suffering was primary. I’ll never know how this feels — a black child and his mother in pain — but in Smith’s book, I found some answers. but who am I to name us nothing? Go see this movie — now. And after the movie’s done, this blog post will be here for with its poems and Chiron’s story, memorialized. I’ll be thinking and dreaming of this for days. There’s something about the way I found out about Alton Sterling‘s death Tuesday night: through a hashtag on Twitter. Sterling was a 37-year old man from Baton Rouge, Louisiana who was pinned down by two white officers wherein one of them fatally shot him. Clicking the hashtag led me to the video of his gruesome and unjust death, as those recording the whole incident screamed and cried in disbelief. It was jarring. The scrolling came intuitively, as I read varied testaments of emotions, photos of protests and articles about the murder of black people by the police. One link was a Washington database of people killed and shot by the police in 2016. Sterling is the 114th black man listed. His crime? Selling CDs outside a convenience store. The next day, Philando Castile was shot to death during a police traffic stop in Minneapolis — all of it captured by his girlfriend on video as well. At the last BET Awards, Grey’s Anatomy actor and human rights activist Jesse Williams gave a searing speech about the need to organize and mobilize for black lives. He memorialized Tamir Rice, Rekia Boyd, Eric Garner, Sandra Bland, Dorian Hunt. He called out whiteness. He called for action. For the full transcript of the speech, click here. To stand with black people is to recognize how deep racism still runs in the country. To stand with black people is to defy the culture of violence perpetrated by the state, by the police. To stand with black people is to understand the pervasiveness of white supremacy. To stand with black people is know that the roots of their oppression are the same roots of global imperialism that continue to oppress people from the Third World. To stand with black people is a fight for humanity. To stand with black people is to be ready when coal meets spark and wind. There’s nothing like queer poets of color who can speak truth to power, paint the most intimate landscapes, reach the most vulnerable parts of us and simultaneously make us swoon / ache. The recent deaths of 49 queer Latinx and Black familia in Orlando cannot impair resilience — it will continue to light up the deepest tunnels where hatred and violence live, the way poetry illuminates and gives life to things we are often afraid to say. Denice Frohman is an award-winning poet and educator, whose work explores the intersections of race, gender, sexuality, and the “in-betweeness” that exists in us all. She is the 2013 Women of the World Poetry Slam Champion, 2014 CantoMundo Fellow, 2013 Hispanic Choice Award, and 2012 Leeway Transformation Award recipient. Her work has appeared in the Huffington Post and the forthcoming book, Jotas: An Anthology of Queer Latina Voices. Saeed Jones received his MFA from Rutgers University – Newark and is a 2011 Pushcart Prize nominee. His work has appeared in publications like Hayden’s Ferry Review, StorySouth, Jubilat & The Collagist. He is a regular contributor to Ebony.com & Lambda Literary. His chapbook When the Only Light is Fire is available from Sibling Rivalry Press. He’s received fellowships from Queer / Arts / Mentorship as well as Cave Canem. Nikky Finney was born by the sea in South Carolina and raised during the Civil Rights, Black Power, and Black Arts Movements. She began reading and writing poetry as a teenager growing up in the spectacle and human theatre of the deep South. At Talladega College she began to autodidactically explore the great intersections between art, history, politics, and culture. These same arenas of exploration are ongoing today in her writing, teaching and spirited belief in one-on-one activism. She is the author of four books of poetry, On Wings Made of Gauze, RICE, The World Is Round, and Head Off & Split, which won the National Book Award for Poetry in 2011. Ocean Vuong is the author of Night Sky With Exit Wounds (2016), winner of the 2016 Whiting Award. A Ruth Lilly fellow from the Poetry Foundation, Ocean has received honors and awards from Poets House, the Elizabeth George Foundation, the Civitella Ranieri Foundation, the Saltonstall Foundation for the Arts, the Academy of American Poets, and a Pushcart Prize. His poetry and fiction have been featured in Kenyon Review, The Nation, New Republic, The New Yorker, The New York Times, Poetry, and the American Poetry Review, which awarded him the Stanley Kunitz Prize for Younger Poets. Danez Smith is the recipient of a 2014 Ruth Lilly & Dorothy Sargent Rosenberg Poetry Fellowship from Poetry Magazine & The Poetry Foundation. He is also the recipient of fellowships from the McKnight Foundation, Cave Canem, VONA, & elsewhere. Danez is the author of [insert] Boy (YesYes Books, 2014) & the chapbook hands on ya knees (Penmanship books, 2013). Danez is the winner of the 2014 Reading Series Contest sponsored by The Paris-American & was featured in The Academy of American Poets’ Emerging Poets Series by Patricia Smith. This Pride season — in memory of the 49 queer Latinx and Black lives lost, in memory of the lost lives of Black transwomen, in memory of Sylvia Rivera and Marsha P. Johnson — we vow to fight against cultures of violence and systems of oppression. May their souls keep on dancing, may they rest in power.